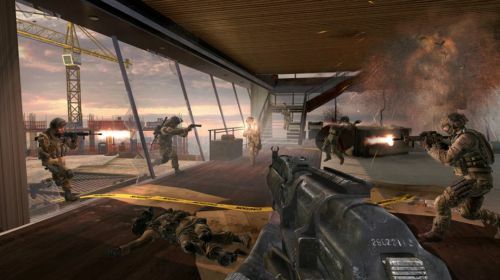 Call of Duty: Modern Warfare 3's sales figures are underperforming. The fastest selling game of all time has sold less units than its predecessor, Call of Duty: Black Ops. This is according to analysts at Macquarie Equities. The actual numbers are not made public, so I guess we'll have to take their word for it. Hell, good enough for Gamasutra, good enough for me. Sales were most notably down in March, where the military shooter only perfomed half as well as it did at this time last year. The 4% total sales drop-off could be caused by a number of factors, including the used game market and the fact that everyone already bought the damn game at launch. Then there's what I would like to call the Mass Effect effect. Mass Effect 3 came out in March, and there really wasn't a comprable big-name game released at this time last year. Good old Commander Shepherd might have reaved some sales. Also, Black Ops didn't have to contend with Battlefield 3, which is another triple-A military shooter which released around the same time as MW3. I would also suggest that the downturn in sale is related to MW3's lack of Black Ops' cooperative Combat Training and Zombies modes, but MW3 has a very solid Spec-Ops mode for co-op players. So I can't blame it on the co-op, which is usually my answer for everything. Maybe people realized that CoD: MW 3 is just a repackaged Black Ops, which is just a repackaged Modern Warfare 2. Either way, they're all good games. I just don't need to buy a new one every year. Either way, we all know lower sales equal doom and gloom. I expect a great gaming crash in the next three to five years. Then we'll all be forced to go outside and play or read a book or (fingers crossed) fight off a real zombie apocalypse. Call of Duty: Modern Warfare 3 is out now on the Xbox 360, PlayStation 3, and PC. It supports two player local and online co-op.